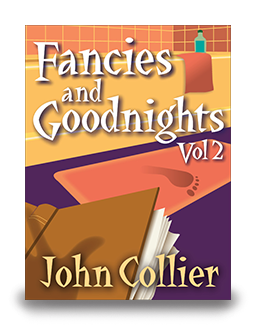 All the short stories of John Collier are now collected in two volumes, Fancies and Goodnights Vol 1 and Fancies and Goodnights Vol 2. Playful and wickedly mischievous, John Collier's short stories will reappear in your memory, to make you smile or laugh or sigh, long after the title and author are forgotten. Talking gorillas posing as writers, hairy fiends dressed as parsons, angels and devils invading the human realm, tricks and turns, a murder committed with chocolates, an unforgettable, dreadful cat — "His chest had the contours of a barrel, though his ribs had been stove in more times than he could remember. His forelegs were stumpy, but ended in huge and ridgy feet, garnished with claws like reaping hooks." — and a love story as beautiful as a symphony are all included in this collection of John Collier's brilliantly structured and perfectly crafted tales. eNet Press has now published in two collections all of John Collier's short stories. There is little to be added to the wealth of praise heaped upon this author by all who review his work. A wonderful collection by a master story teller. -- Sleeping Beauty (1941) -- Night! Youth! Paris! Other readers might like to know what you think of this book. Write a review. If you find typos or other errors, we want to know that too. Report an error. Enet Press website Copyright 2016 • eNet Press Inc. • All rights reserved.